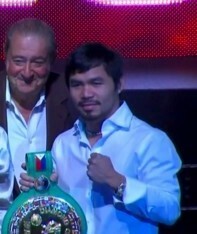 Is Arum denying Pacquiao the Marquez and Mayweather fights? By Ellis Belither: It has become pretty clear over recent weeks that Top Rank CEO Bob Arum is not interested in putting his No.1 fighter and money-maker WBO welterweight champion Manny Pacquiao in the ring against Floyd Mayweather Jr. any time soon. This is probably a wise decision if Arum wishes to continue to gain maximum revenue from Pacquiao’s fights. However, it has now come to my attention that another bout with Juan Manuel Marquez, which was well and truly on the cards, has now also slowly slipped out of the equation unnoticed by many because of all the hype and optimism people had for the Mayweather fight happening. Has Arum been super clever and managed to avoid the two fighters his cash cow has a good chance of losing against just so he can gain another purse or two before throwing him in with Mayweather? Because that fight is now looking like an end of year match up, which if Manny does lose, will never make Arum the same kind of money ever again. In my opinion Arum should of let his fighter have Mayweather this May all excuses aside and cash in on one more big purse from Manny before moving on to younger boxers. Neither Floyd or Pac are getting any younger and I only see this fight getting less appealing to Money, and fight fans as time wears on. Boxing » Floyd Mayweather Jr » Is Arum denying Pacquiao the Marquez and Mayweather fights?